Description: Possibly annual herb, usually 30–60 cm high, with fine pale ± appressed hairs to ± cottony. Leaves with lamina elliptic to obovate, lower ones c. 10–18 cm long and 3–5.5 cm wide, upper ones usually 4–7 cm long and 1–2.5 cm wide; petiole to 2 cm long. Heads solitary, terminal on main and side branches, usually subtended by 1-several small leaves and nodding. Outer involucral bracts spreading or reflexed, lanceolate or elliptic, acute, entire, pubescent; inner bracts narrow-oblong, acute, obtuse or rounded, margins often slightly toothed, erect. Florets yellow. Achenes c. 4 mm long. 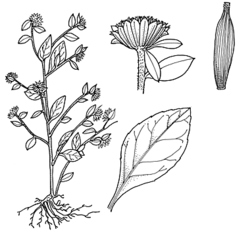 Distribution and occurrence: Grows in forest and along roadsides; probably naturalized, north from the McPherson Ra. Native of Eur. & Asia.